Jamie Oliver's Food Revolution. Reality or Not? 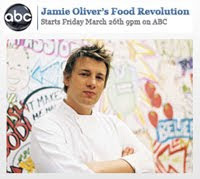 On March 26th at 9pm, Jamie Oliver's Food Revolution reality show premieres on ABC. Jamie travels to Huntington, West Virginia, aka the unhealthiest town in America as deemed by the US government, and embarks on a journey to save the health of the entire town, around 50,000 residents. You say Potato, I say Tomato. In the trailer for the show, there is a clip of a classroom of elementary school students who don't know that tomatoes are tomatoes. They call them potatoes. There is another clip of Jamie reacting in shock when greasy pizza is being served as 'breakfast' in a school cafeteria. Then there is another clip of a wilted-faced obese woman sobbing in frustration to Jamie over an enormous pile of greasy, processed, high fat/sugar foods like pizza and snack cakes. Can Jamie, save her, her town and spark a food revolution in America? "We don't want to sit around and eat lettuce all day." - radio show host in WV, as he remarks critically to Jamie's arrival. The radio host went on to say, "I don't think Jamie's got anything that can change this town. He can try all he wants though." Jamie responds later by saying: "I thought there were only miserable bastards like that in England." Obviously Jamie's arrival was met with some criticism from the town. And quite frankly, I usually have doubts too when I hear someone (especially on a reality show) say they are going to "save" someone else. In my experience, you can only save yourself. We are all responsible for the decisions we make. On the other hand, I am incredibly hopeful that Jamie will work nutrition miracles (and inspire a nation) simply because of his record of success. He has lead the war on childhood obesity in the UK and helped to make drastic improvements in a school lunch program there. You can read his manifesto here. He was also recently awarded the TED prize. And TED has a grand reputation for honoring genius-minded individuals. So is Jamie a nutrition savior of sorts for Americans? Reality or Not? It is obviously admirable to want to 'save a town' from their fatally unhealthy ways. But the real question I keep asking myself is: is Jamie's blueprint plan for saving Huntington realistic for the rest of America? It's easy to put down the box of Ho Ho's when you have a 5 person camera crew two feet from your face. And it's easy to be motivated if you have a public weigh-in that will air across the nation. And it's easy to say 'yes!' to health when your have a motivating and talented Chef like Jamie Oliver leading you by hand. But will the healthy changes last? Will the town truly be changed forever? Will fruit and veggie sales go up and processed junk food sales go down at area supermarkets? Can Jamie really have a Food Revolution on his hands? These are the questions I ask myself. I also question the self-awareness an overweight person has when they continue to eat unhealthfully. Do obese individuals have a choice to be healthy. Maybe they are like drug addicts and are addicted to their unhealthy lifestyle and junk food. In that case, wouldn't they need a therapist and not a Chef? The Reality Show Effect. We've all seen reality show participants get healthy, lose weight and kick addictions on national TV, only to resume their unhealthy ways a few weeks later. But yes, there are other cases, such as on The Biggest Loser, where contestants have maintained their healthy lifestyle. But is it social pressure to not fail? The, "we'll be back to film your results in two months" mentality of fear to succeed? Or is it a true and whole-hearted lifestyle change? I do not have the answers, but I am hoping that a few of these questions will be answered when I watch the show later this month. Nutrition Nightmares? Jamie's Food Revolution show sounds a bit like Gordon Ramsey's famous reality show "Kitchen Nightmares". Only instead of dealing with hit-rock-bottom, failing restaurants, Jamie will be dealing with failing hit-rock-bottom people and their health. You can't simply scream at them about their customer service skills, show them how to properly saute some mushrooms, summon their finance records and point out specific errors, buy them new dining room furniture, repaint the walls and say voila! to increased clientele. Changing people from the inside out, in regards to their lifestyle, requires an emotional and intellectual connection to them that requires heart, persistence, creativity, skills and energy. Has Jamie got it? We'll see. What do you think? We can learn so much from each other. Reality television shows can not only entertain us - but they can teach, awaken and educate us - even if "reality" really isn't reality. I'm very interested to see what Jamie will uncover in this town and how successful he will be in the short and long term. I'll be watching. Will you watch?